Bacon Potato Nests: Crispy bacon shaped into a basket, filled with creamy potatoes topped with a small dab of salsa, the perfect appetizer to prep the night before then assemble as your guests are arriving! 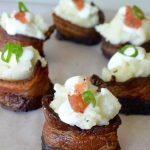 Bacon Potato Nests. I know, another bacon recipe…. but what can I say? Whenever I post a recipe with bacon in it, it goes over really well. And it is BACON? Anything with Bacon usually steals my heart! I love this recipe for Bacon Potato Nests. Like most people Im really watching what I eat ~ translation: summer is coming and I am trying to drop a few pounds! I’m trying to get back to being healthier/lighter and find when I eat less carbs but still get great flavor I actually stick with a healthy plan. Honest confession, I am a yo-yo when it comes to eating correctly. Finding an exercise program that I like and stick to makes all the difference in the world to me. It really makes no sense, if I exercise regularly, I eat less. If Im not exercising I show no restraint either in the food or drinking area. When I’m working out you can put a plate of fries in front of me and I can just eat a few of them. In my head I literally think “I did not just get abused by my trainer so I could blow it all in one meal.” Does anyone else do that? With the crazy growth of my blog at the beginning of the year I gave up my bootcamp. Im back to it now so Im trying to make up for the 3 months I was really bad. I LOVE food, so I don’t completely give up anything, instead try to just eat smaller portions. This recipe for Bacon Potato Nests is the epitome of that philosophy. I can eat 3 of these and satisfy my craving for bacon and potatoes! Its only 1.5 pieces of bacon and small bite of potatoes. Top with a little sour cream and a healthy salsa and you have a very satisfying, low carb/calorie item that fits in at any social occasion! Don’t you love it when you can eat the same things as you are serving at a party and not feel like you are blowing your diet? 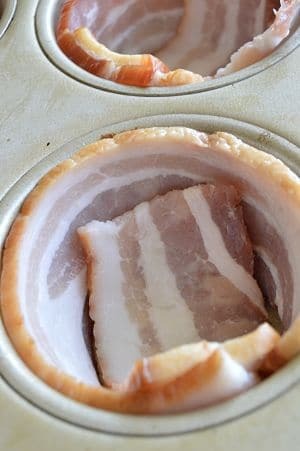 You roll the bacon out with a rolling pin so the it doubles in length then mold into a muffin tin with 2 pieces like I have done here. Rolling the bacon thinly allows for less bacon per piece (less calories, but still packed with flavor!) You wrap the bacon around the side edge, then cut a smaller piece to go across the bottom to create the basket. Wrap cut bacon around edge of tin first. Once the basket is crisped, spoon in your potato and top with a bit of sour cream, salsa or both and you will have a bite-sized bacon treat. Easy/Hard? Personally I thought the hardest part of the Bacon Potato Nest Bites recipe was not eating all of the bacon when it was made into nests? The bacon can be fragile after rolling it thinner, but you can still mold it into shape in the tin so that it works. Planning: Make the bacon basket and mashed potatoes up to 24 hours ahead and then just assemble and pop in the oven to warm when your guests arrive. The aroma of the bacon will have their mouth’s watering. Cocktail Pairing: These would go great with any red wine… I am really into Grenache’s right now. These pair equally well with Bloody Mary’s or for something a little out of the norm try them with a Saketini. Give them a try and let me know what you think? We enjoyed these so much Im already working on other things to put in the Bacon Nests for a future post! Using a rolling pin, roll the bacon to twice its size. Then cut bacon into smaller pieces, each piece of bacon will yield 2 bacon nests. I cut the bacon into thirds. Then cut one of the pieces in half. For a total of 2 longer pieces and 2 shorter pieces. 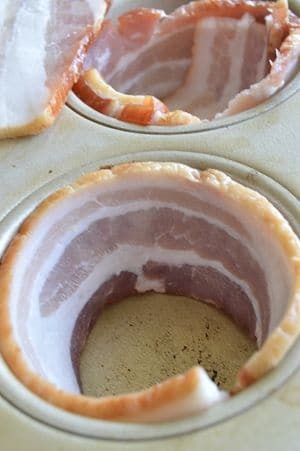 Referring to diagram in blog post, place longer piece of bacon around edge of muffin tin, then using smaller piece cover center to create a nest. Place in hot oven and cook for 15 minutes, then flip the pan and bake for an additional 15 minutes. All ovens are slightly different. You want bacon to be fully crisped, and browned, but not burnt. Remove from muffin tin and blot away any excess bacon fat. Reduce oven to 300°,place each potato filled nest onto parchment lined baking sheet. Bake for 15 minutes until potatoes are warmed though-out. Top with sour cream, salsa and or green onions and serve. My husband would love this recipe! He’ll add bacon to anything and everything! Great job with your photography! Looks so yummy! Omg can we say yum?!?! 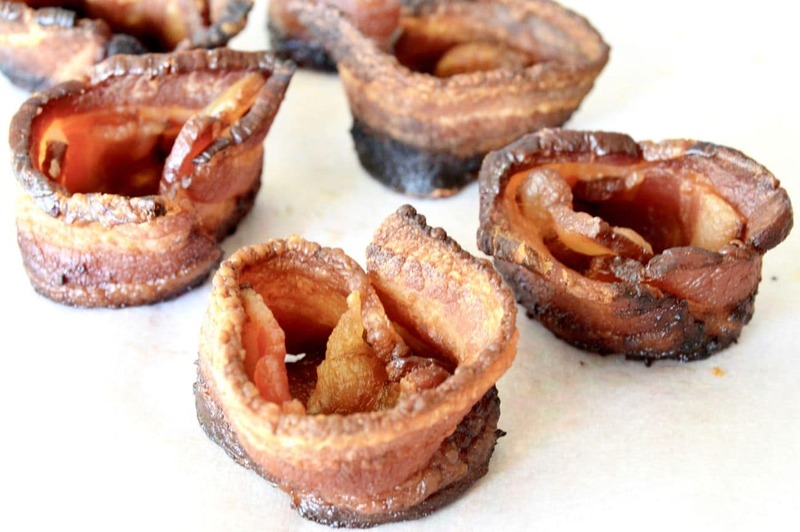 You had me at bacon with this recipe!! Definitely making these! These look soooooooo good! I took a break from my healthy eating for a wedding over the weekend, but may have to extend that break even longer so I can eat a whole batch of these! I think it totally makes sense what you said about working out – it’s hard work, you don’t wanna make that a waste of time by eating terribly! Michelle~ my favorite part of this snack is I can eat 3 and not blow the diet! ~m But then again, I worked out for a long time to everything in moderation right? Yep, totally! Besides, you’re more likely to fail if you don’t let yourself have yummy things anyway! Perfect idea for parties and also brunch parties! I;m sure guests would go crazy and probably forget about the rest of the food! 2 tablespoons of mashed potatoes and 1.5 slices of bacon…. totally low carb and full of flavor in three glorious pieces! 🙂 WIN/Win! 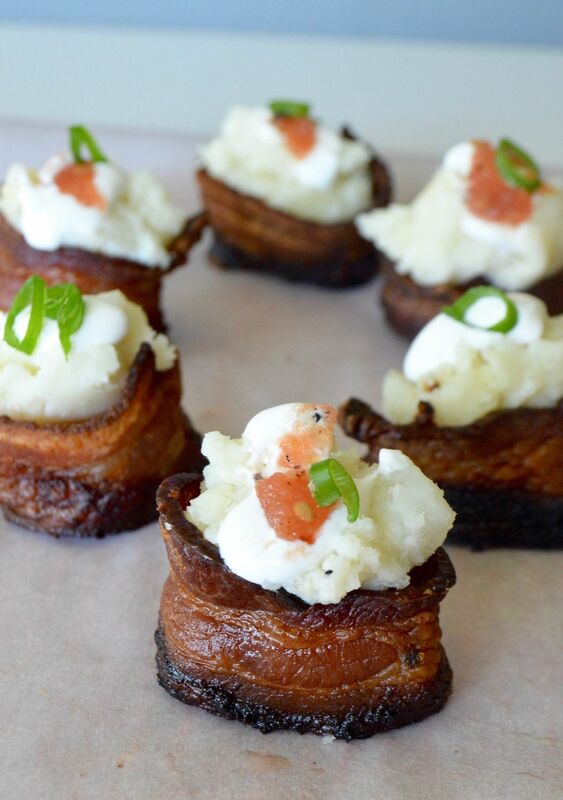 These bacon nests would make the perfect apertif for any party. I am sure that guests would be thrilled at the presentation and taste. What a fun tasty idea. I want these so bad. I also have never thought about rolling bacon to make it thinner, great tip. Oh my these look absolutely delicious! It’s one of those recipes I have to try at least once! I love your tip to roll the bacon out to make it stretch. Genius! Oh my you have combined two of my families favorite foods in one!!!! This will be added to my list of stuff to try!! Oh my goodness. Those look absolutely incredible!!!! I bet my husband would be beyond thrilled with these if I made them for him this weekend. These look so amazing! I love an appetizer that has so few ingredients but is yummy like this. Perfection. Oh my goodness, these look delicious! We love anything bacon in this house and I know these would go over so well. I’m pinning for future reference! These look absolutely delicious! My boyfriend saw them on my computer screen and literally said “We need to make those”. Guess I’ll be heading to the grocery store! Love anything with bacon! My husband really enjoyed being the taste tester for this one too! Oh my goodness, these look so good! I love almost anything with bacon. I’ll have to make these for the next family get together. What an adorable appetizer. Looks fancy but easy to make. You can never go wrong with bacon and potato in our house! Oh my word. These look amazing! One of the first times I have seen a recipe that I want to get up and make this second! OH MY! What a delicious side dish or appetizer! I want to try these soon! These look really good! I can make them Paleo by using mashed Yucca – I just may give that a try. I think these look so good! Not too hard to make, either. I’m thinking it will be the same as a twice baked potato. Thanks for sharing the recipe and the tips for making them. You had me at bacon. These look so good to eat. what a fun thing to do. I’d love to try this at dinner time. In fact, I just might do that. You, my dear, are a genius. I have never seen anything like this made with bacon, but I LOVE it and I can’t wait to try these. OMG, these look amazing. I adore your site! Ingenious, I love the idea of the bacon nests! And the soured cream mash sounds just like the perfect contrast! I definitely do not see this as a dinner party kicker offer… primarily because I would disappear into a locked room with them all, devour them and not have anything to offer my guests and not really feel like eating my dinner afterwards 😀 They sound awesome! bacon recipes will never be too much 😉 plus this one just got my heart! Good photography, though I don’t eat bacon. I will try with potatoes. You had me at bacon, Michele! 🙂 These would make some great appetizers, or dinner for me! Perfect little bites. Love the combination of bacon and potatoes. You make me hungry! Say bacon and I am so there!! These would make perfect BBQ/party finger food. Looks really good. I am not a fan of bacon but I would try this. I’m not vegetarian, I’m just not into bacon. I guess bacon it’s more of an american thing no? hmmm, Ive never thought of bacon as an american thing, but perhaps you fancy ham? I think ham baskets would work too! I love bacon and I love potatoes, so what more could I want ? This looks perfect! Yes bacon does make everything better! These are fantastic! Such a great unique appetizer!